Notice: This is an old thread. The last post was 2737 days ago. If your post is not directly related to this discussion please consider making a new thread. Every researcher or diagnostician working with reptiles has faced the challenge of identifying reptile hemoparasites and then determining whether they are of importance or merely incidental. Another challenge is how to easily find the information required to make the proper identification. 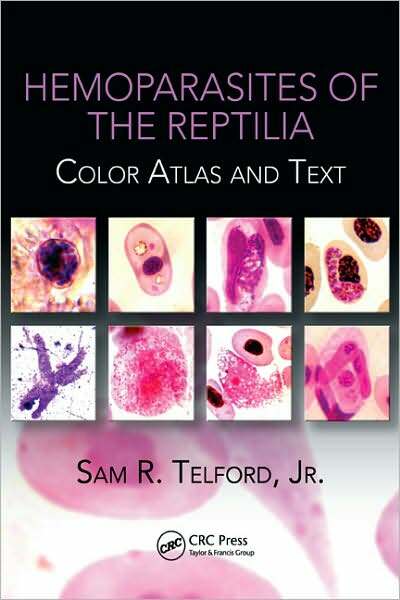 A distillation of knowledge from world-renowned expert Sam R. Telford, Jr, Hemoparasites of the Reptilia: Color Atlas and Text provides a comprehensive compilation of information on how to differentiate between the myriad species of reptile hemoparasites. The atlas provides diagnoses for 262 species of plasmodiids, hemogregarines, hemococcidians, trypansosomes, and leishmanias, including descriptions of eight new species or new taxonomic designations. It also discusses lesser known groups, such as piroplasms, rickettsiae, chlamydia, and erythrocytic viruses. Each genus and many species are represented among the 166 taxa illustrated in color. The species accounts contain host and geographic distribution, with precise localities when possible, prevalence, life cycles and vectors when known, effects upon the host, and ecology of the host-parasite relationship, morphological variation, and an exhaustive bibliography. The book also includes an illustrated key showing diagnostic characters. Telford draws on his 45 years of experience and his personal collection, considered the world’s most complete, to provide information on the morphology of the unicellular parasites of reptilian blood. He includes information from hard-to-find original papers and articles from sources throughout the world. The illustrated key and photomicrographs from Telford’s collection make identifying species quicker and easier. Last edited by Motoko; 6th September 2012 at 07:09 PM. Reason: UPDATE! Last edited by Motoko; 12th October 2018 at 08:19 PM. Reason: UPDATE.